Increased mobile use leaves businesses looking to strengthen their mobile presence and capabilities. 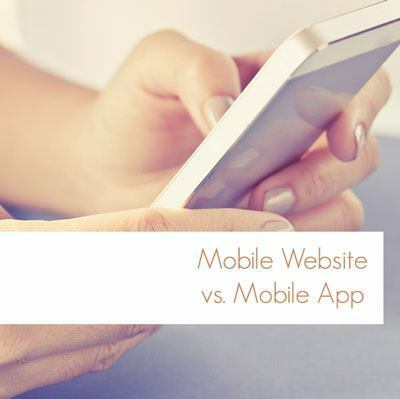 The question every business struggles with is debating between a mobile website vs. mobile app. Being a Chicago web design agency leads to a great deal of questions that beg for a better understanding of mobile use. Web design for mobile use is becoming increasingly important. One Device Research Report found that 25% of people in the US are mobile-only web users, meaning individuals who infrequently or never use a desktop computer. In developing nations the number is much greater, as high as 70% in Egypt. Even those who often use computers for internet access rely heavily on their smartphones for constant web access. That being said, businesses must now account their web design for mobile use, which means determining the benefits of a mobile website vs. mobile app. Choosing between making a mobile website vs. mobile app and which is more important depends on a variety of factors. What is the difference between a mobile site and a mobile app? Web design for mobile use oscillates between using a specially developed app available for download and a regular website optimized for mobile use. Before determining what to use for your website, you must understand the differences between them. Both options can be created by a Chicago web design agency like ourselves, and both are accessible to anyone using handheld devices like iPhones, Androids, and tablets. A mobile website is just like any other website, but is displayed in proportion to the size of the screen for easier use. With mobile sites, there are actually two options: customized web design for mobile use can lead to special mobile sites that are formatted differently than your normal website with a different URL, but lately web design customers are opting to use responsive web design templates. Our Chicago web design agency prefers to use responsive web design as it looks even more appealing for people using every kind of device that retails the same URL for more SEO power, and your great- looking website will retain its features on the smaller screens by only shifting slightly. Apps are actual applications downloaded onto the phone via the iTunes store, the Google store, Blackberry App World, etc. Apps can pull data and content from the internet, or be designed to work without an internet connection. They require a separate creation from the website, which specialists like the web designers at our Chicago web design company are trained to do. App use is typically for returning visitors, because the app remains on the phone after it is downloaded. Mobile website vs. Mobile app: Which is better? The best web design for mobile use is never clear cut, even in the mind of a Chicago web design agency. Mobile sites and apps each have their advantages and unique way of working. In the end, the best option depends on the company or organization and their industry, goals, budget, customers, and time. Generally, Chicago web design advisors say you should focus on creating a mobile site, particularly a responsive website, before getting into any app creation. An app can be great but if people do not always know you have one or want to download it. A good website is always easy access. Compatibility: Mobile and responsive web design is compatible across all devices using a single site, whereas apps have their own development and final product that your site. Keeping things linked can be helpful. Instant use: Mobile sites are right at the user’s fingertips. There is no purchase, download, or account required. And when people think of visiting your site, it is much more instinctive to check out the site on the internet browser than to look into an app store. Easy discovery: Websites for mobile devices can be found more easily that apps. Again, users tend to look on internet browsers instead of the app store. People can share these sites more easily. Also, they can find your site through google and industry- specific directories that are not available for apps. Upgradability: Upgrades are easy and instant for mobile sites like they are for normal websites. Our Chicago web design agency can simply make a change at the back-end of the website and the changes appear for the user. With apps, an update download needs to be pushed to users. Less time and money: Responsive web design for mobile use and mobile versions are created by a Chicago web design agency at little to no additional cost. It doesn’t take up all the additional time and money needed for our Chicago web design firm and others to create a new app, so your business benefits by spending less on its internet presence. Support: Web design for mobile use is a process. Work with your Chicago web design agency will continue after the site (or app) is launched. So, using the same support as the website you already have is much cheaper and more sustainable than having a separate upkeep for your app. Interactivity: Despite the inherent benefits of responsive and mobile websites, apps remain popular because they are integrated into the users’ lives. It is worth making an app when your industry can be interactive with the consumer. For gaming and other interactive purposes, an app makes perfect sense. Consistent Use: If your company has many return visitors that have reason to frequently return to your site, the app wins in the battle of mobile site vs. mobile app. Someone who regularly shops with you, references your information, or otherwise would use your app a lot, go with an app. Personalization: Targeting users who wish to personalize content, search results, or information can be done through an app. Users love this. Complex reports: If your app will perform complex calculations and reports, then it is worth the resources to build an app. Think banking and investment types of reporting. No connection required: If your audience will appreciate offline access to your pages, they will appreciate an app. Native functionality and processing: For anyone wishing to use a phone’s camera or processing power, apps do come in handy. While browsers can access many mobile features like calling, SMS, and GPS, there are still some limitations. When it comes time to make a choice, take the time to analyze the two mobile options and how they work with your company’s situation and needs. A mobile site is a logical choice when it comes to a marketing-driven purpose; interactive engagement and high workloads for the device are more for apps. As long as mobile use remains a growing and undefined frontier, the debate between the two choices will continue. Ask our Chicago web design agency to help you determine which is about the best web design for mobile use to see what is right for you and your business.